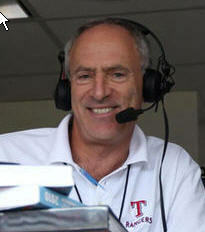 July 28, 2014 - Eric Nadel, longtime ASA Member and radio voice of the Texas Rangers, received the Ford C. Frick Award during the annual National Baseball Hall of Fame Induction Ceremonies in Cooperstown, NY, this past weekend. This year marks Nadel’s 20th as the lead voice on radio broadcasts and 36th year overall of broadcasting Rangers baseball. It's the longest tenure of any announcer in the history of the franchise and the second-longest continuous current stint with one team in the American League. The following is a transcript of his acceptance speech courtesy of the Dallas Morning News. “Thank you Jeff… and Jane. It’s hard for me to believe that I am actually standing here accepting this award on the diamond in the middle of Doubleday Field. Because…exactly fifty years ago tomorrow…July 27, 1964…I was sitting …in those stands.. RIGHT THERE! I was a baseball-crazed 13 year old from Brooklyn on a field trip from Camp Equinunk and I was in those bleachers, watching the Mets play the Senators in the Hall of Fame game. Now….if memory serves….both of those teams were looking for their first win of the season. …Some of my Camp Equinunk bunkmates came here today from as far away as Florida. Thanks guys. Sorry I could only get you the same crummy seats. We were also here the previous year. We saw the Braves play the Red Sox. One of the Braves pitchers, Bob Shaw, had actually gone to our camp. We were disappointed he didn’t get into the game. But when we were about to leave he got on our bus.. This was amazing. A real live major league baseball player. In uniform. He told us that if we worked hard and followed our dreams that we too could someday make it to the major leagues, maybe even Cooperstown. None of us thought it was really possible, and yet, somehow, here I am. Who could have imagined it? Like most baseball announcers I began as a player. I think it lends another dimension to my broadcasts when I can draw upon the inside knowledge and experience I gained as a star catcher…. for Monaco Cleaners in the North Highway Little League. I was not much of a fielder I’m afraid, but I could hit for power…so after a couple of seasons, like so many others, I left and played Little League ball in Japan. But a key moment came one day in the late ‘50s when I was riding with my father in his 1955 De Soto convertible — and we were listening to a Yankee game. I asked my dad if Mel Allen, the great Yankee announcer, was getting paid to broadcast the game. And with that, I knew my lifelong course had been charted. I too would become a spokesman for Ballantine Beer. And…oh yeah… do play-by-play. So I knew what I wanted to do. The question was: how do I get there? I took the usual route to the majors. I announced minor league hockey. That led me to Hockey Town USA – Dallas, TX …as the voice of the minor league Dallas Black Hawks. Two years later the team moved to New Brunswick, Canada …..and they forgot to tell me. So I found myself out of work. Then, completely out of the blue I got a phone call from Roy Parks, the director of broadcasting for the Texas Rangers. Roy said he was looking to hire a young announcer and wanted to know if I had ever broadcast baseball. “Of course I did”, I replied. Which was a complete lie. I was asked to do a 4-game audition into a tape recorder at the old Arlington Stadium. And I admit I might have been a little shaky. But….other than calling a triple a hat-trick… and saying the first run came at 5:16 of the second inning, I managed to somehow pull it off, and I was hired to start broadcasting Texas Rangers games in 1979. I still suspect the real reason they hired me is that I was already living in Dallas and they could save on moving expenses. Fortunately for this rookie, I had an incredible announcer to work with and learn from…the inimitable Jon Miller. Jon taught me how to adapt my style to baseball’s leisurely cadence, how to use my personality on the air, and many of the nuances of the game. He also taught me how to dress for radio…you know, Hawaiian Night at a Shriners Convention. Jon moved on, but I stayed in Texas. And I feel proud and blessed to have spent my entire baseball career in one city, with only one club. I just pray the Rangers don’t move to New Brunswick, Canada. Now for the thank you‘s. I have been very fortunate when it comes to broadcast partners. For 13 years I worked with one of the all-time greats, Mark Holtz. Had it not been for his untimely passing in 1997, HE would have been standing on this stage …years ago… accepting this award. My chemistry with Mark and our friendship …is one of the great gifts of my life, and I don’t think I would have lasted very long in baseball had it not been for him. Baseball is a sport that builds bridges between cultures, and I’ve been blessed with the opportunity to learn Spanish and visit the homelands of our Latin American players. A mis amigos y maestros latinos, mil gracias por su ayuda.. y por haberme recibido con los brazos abiertos aceptandome en sus paises, en sus hogares, sus familias.. y ensenandome sus costumbres y culturas. Ha sido para mi un placer servir a mis oyentes latinos al mismo tiempo que a todo mi auditorio. Thank you to my extended family…(lots of cousins here today)….and my wife Jeannie’s family, for truly making me part of your family. And thanks to all my friends who have traveled here today…buddies from Brown University, classmates from Midwood High, even fellow graduates of ps193..okay, maybe not all of you actually graduated. Thanks for sharing this with me, even if I couldn’t get Sandy Koufax’s autograph for all of you. Or any of you. It saddens me that my parents are no longer with us to enjoy this. Although they would have voted for doctor or lawyer as my profession, they indulged my passion…they drove me to countless Yankee and Met games until I was old enough to take the subway …. (I think that was about my fifth birthday)…and they bought me my first tape recorder when I was 14. To my former broadcast partners and colleagues who took time off from their seasons to be here today…I can’t possibly explain how moved I am by your being here. I have worked with some of you, mentored others…and most important, learned from all of you. Thanks for being my partners, and my friends. I am deeply indebted to the TX Rangers owners and front office for always allowing me to be honest with our fans…. In many of my 36 seasons, what I have seen was not pretty. I especially thank Eddie Robinson, my first general manager, who went to bat for me, to Jim Sundberg & Frank Lucchesi for speeding up my learning curve, and to John Blake, the best ever Senior Vice President of communications. John, you have always looked out for me, made my job easier and been a great friend. To my sister Laurie….thanks for your brilliant open mind…. For your courage…and for teaching me that the conventional path is not the right path for everyone. Now please forgive me if I state the obvious …being married to a baseball announcer is not an easy thing…especially if the one you are married to happens to be me. To my beautiful wife Jeannie, thanks for your love and for being my best friend, and for always being there for me. And for always reminding me of why I am on this earth….that is, in her words, to be a light in the world. I am trying to live up to that challenge every single day. And most of all, thanks to all the Rangers fans. Over the years you have invited me into your homes, your cars, your places of work…and your computers, Iphones and other devices that I still can’t figure out how to use. You gave me a chance to learn this gig on the job, and kept listening through all those very lean years. As a team, we still haven’t won the big one….but we won this award together. And the pain and frustration we have experienced has brought us closer together. And in the meantime, we at least have this award to celebrate. I can honestly say that I am proud to be a Texas Ranger, and I know you are proud to be Texas Rangers fans. And finally, I would like to accept this award for every kid who ever tucked a transistor radio under his pillow to listen to a game after his parents had made him go to bed….and to all the kids who have played Strat-o-matic baseball while making believe they were announcing the games, as I did. For all the other play-by-play announcers out there…. major league, minor league, college and high school. To those who have not won this award or made it to the big leagues…and for those who gave up on ever getting there. Remember, I am a converted hockey announcer and I was often told that my voice wasn’t good enough to make it as a play-by-play announcer. If I can make it all the way to Cooperstown, there is hope for everyone. On two different occasions, I was one lucky phone call away from giving up this dream …packing it in and going to law school. I can just hear myself… “Today’s closing arguments are brought to you by Ballantine.” I don’t think I would’ve made a very good lawyer, and I certainly would not have been a very happy one. We are fortunate to make our living in the world of baseball and broadcasting. We do what we love to do, and going to work is fun. We have the opportunity to bring joy into people’s lives, and to touch people with the gift of this great game. And most important of course….we have the chance….every day….to be a light in the world. Let’s never forget to keep that part of the dream alive.